The best book for beautiful Rainbow Loom instructions! With millions of Rainbow Looms sold, the colorful toy is off to a sizzling start and shows no signs of stopping. Skyhorse Publishing and Instructables join forces to bring you the best in Rainbow Loom projects. From toys to jewelry, The Ultimate Unofficial Rainbow Loom (R) Guide will show you just how much you can do with a few rubber bands, a hook, and a little imagination. Brought to you by the very best Rainbow Loom enthusiasts at Instructables, these projects will keep you looping and weaving for hours on end. There's no need to fear confusing instructions: these projects are made by loomers just like you. Learn how to: Loop your way to a cute ring Weave a fishtail bracelet Make your own Rainbow Loom poodle Stitch together Rainbow Loom shoes Create vegetable garden charms Use a fork to make a necklace From simple rings to funky goldfish charms, the looming-made-easy instructions allow anyone to master the Rainbow Loom. Create funky bracelets to stack on your arm, or surprise your best friend with a customized charm necklace. Spice up every day household objects with Rainbow Loom accessories. Because the simple steps are paired with clear photographs, when in doubt, just look! Multiple project options give you the opportunity to find the best way of creating your rainbow collection. After all, every craftsman has a unique way of doing things. 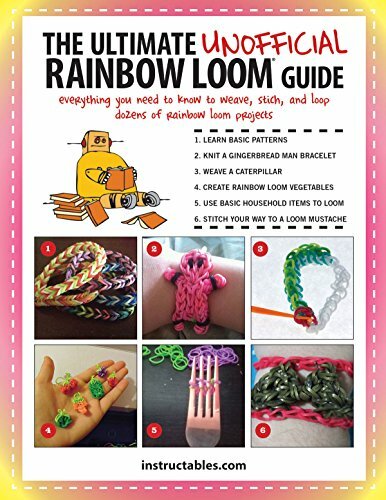 So bust out your loom and gear up for a heavy dose of color The Ultimate Unofficial Rainbow Loom (R) Guide will turn you into a loomer extraordinaire. Instructables.com is a bona fide Internet sensation, a web-based community of motivated do-it-yourselfers who contribute invaluable how-to guides to the site on a wide range of topics, from gardening and home repair to recipes and gadgets that defy categorization. The site hosts more than 100,000 projects. More than 15 million people visit the site each month, leaving comments and suggestions on the ever-growing list of do-it-yourself projects.